As you plan for your perfect wedding day, things are going to get tumultuous. It’s an exciting time, but it’s also a stressful one. To fight the stress of the day, you and your future spouse could exchange gifts as a gentle reminder or private commemoration of your love for one another. If you’ve given it some thought and you’re coming up short, here are some ideas for delivering the perfect gift to your future partner. If you’d like to save a little money without sacrificing sentiment, exchange handwritten notes on your wedding day. For a keepsake you can both enjoy, purchase a piece of clothing with the date of your wedding monogrammed on it. A high-quality hoodie is both unisex and endlessly wearable. Get tickets to an upcoming concert or play that you can enjoy together as a date night. Gentlemen can never go wrong with something a little sparkly. Consider buying some earrings or a necklace that your future wife can wear on or after her big day. Any item that identifies your future wife as “Mrs.” would be well-received. Grooms can also set up a series of small gifts for their bride to be delivered throughout the day: coffee in the morning, a midday snack, and a bouquet of flowers right before the ceremony. Nothing says old-school cool like a watch or pocket watch to go along with your future husband’s finery. Get a pair of cufflinks that sport the logo of his favorite sports team or comic book character. Many future husbands will also appreciate a few high-quality cigars or a bottle of expensive liquor that they can share with their friends after the ceremony. Fortunately for any bride out there who is searching for the perfect gift for their groom-to-be, you have an ally in Jim’s Formal Wear. While your future husband is designing the tux of their dreams, you can sort through our incredible selection of accessories. 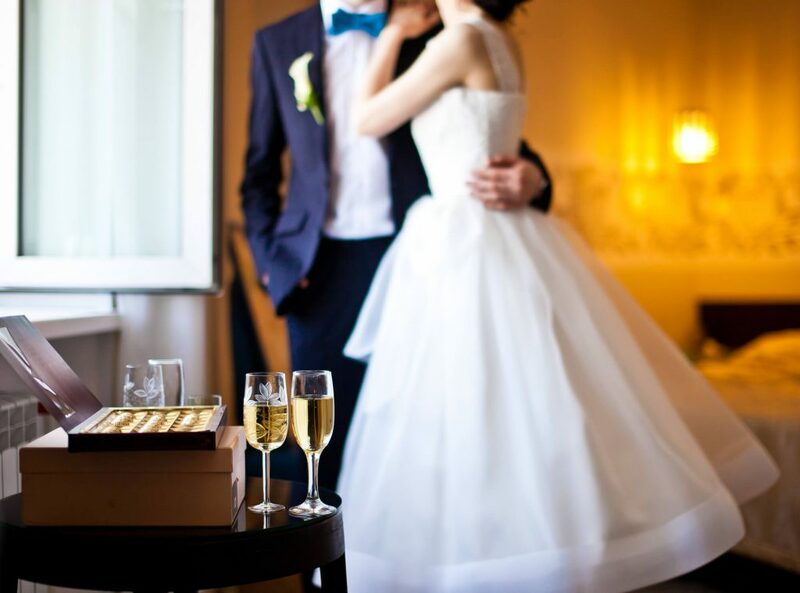 Our ties, socks, shirts, and more will help you find the perfect way for your fiancé to remember your wedding day. Stop in today and let one of our sales team help you make your wedding day something special.